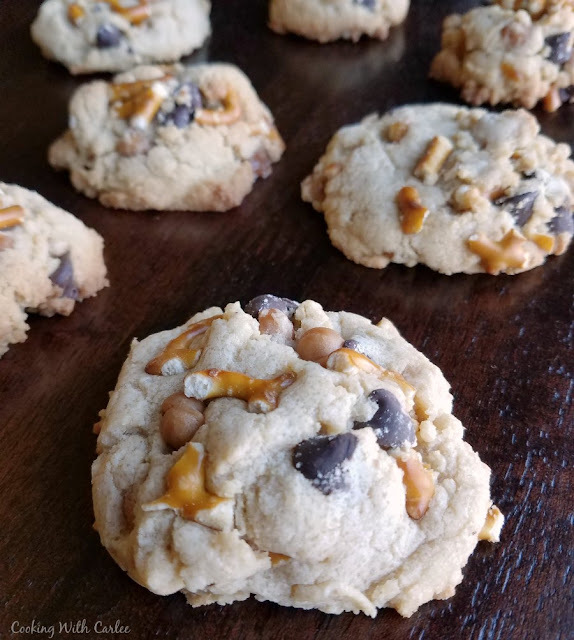 Sweet, salty, crunchy and soft, these cookies have it all. Full of caramel, chocolate and even bits of pretzel. They mimic the Panera kitchen sink cookies. It is that time of year. The festive Christmas decorations are put away. The cozy glow of the tree is gone. It is still dark and freezing outside and the holiday cheer isn't there to make it tolerable. The Christmas cookies have been gone for at least a week. Sad stories all the way around! Some good friends of ours were blessed with a baby girl a few days after Christmas and they were feeling up for visitors. I had plans to make them a pan of baked ziti they could heat when they were ready. Of course they would need a sweet treat as well. I love to bring cookies to new parents because they don't take a plate or silverware. They are perfect to grab and go and easy to eat with one hand. A couple of weeks ago I thought I'd be perfectly happy not seeing another cookie for a few months. After baking and decorating all of the sugar cookies, gingerbread men, peanut butter blossoms, peppermint mocha shortbread cookies and the like it seemed like a break was in order. But it turns out I was happy to be digging out the cookie sheets at the first hint of an excuse! As cold as it's been, turning to baking for that warm and cozy feeling was definitely welcome. I wanted to make something easy and far away from the holiday flavors. Plus they had to be made from ingredients I had in the house. These sweet and salty drop cookies were just the thing. Little Dude and I had these whipped up in no time. He loved crunching up the pretzel bits. I loved starting with melted butter, so I didn't have to plan ahead and soften anything. The results were delicious. They had a nice buttery flavor and texture with crisp edges and soft centers. 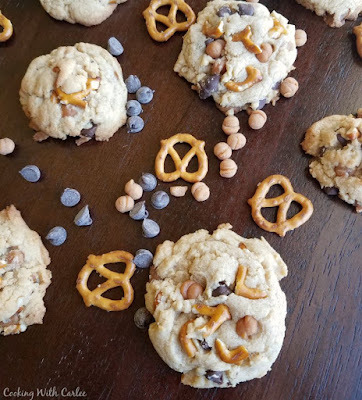 The chewy of the caramel, crunch of the pretzel and creamy chocolate were delicious together. Of course that sweet and salty combination is always a winner too! We took half of the batch to our friends and I got to soak up some baby cuddles and watch the boys play. They seemed to go over well there. We took the other half to my parents' house where everyone enjoyed them, but one brother liked them particularly well and nearly finished them off! If you are looking to change up your cookie routine, these are a fun way to do it! The pretzel bits are definitely unexpected and fun. What are your favorite off the beaten path cookie stir-ins? Beat together the melted butter, sugars and vanilla until the butter is cooled and the mixture is lightened a bit. Add the eggs one at a time, mixing until incorporated. Stir in the flour, baking powder and salt until just incorporated. 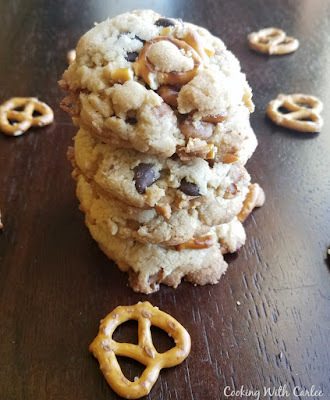 Fold in the broken pretzels, caramel bits and chocolate chips. 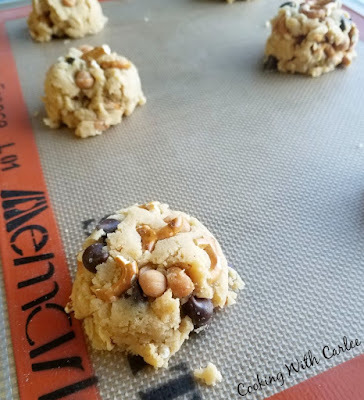 Using a large cookie scoop (about 3 Tablespoons), scoop onto prepared cookie sheets. Leave at least 2 inches between cookies. Flatten slightly and top with a few additional chocolate chips, pretzel or caramel bits if desired. Bake for about 10 minutes. The edges should be just starting to take on color and the centers should still be soft and puffy looking. Cool on the cookie sheet for 5 minutes before removing to a wire rack to cool. Best served warmed with a glass of milk or cup of coffee. That brother you mentioned that about finished off the cookies-here's how that story ends: I asked him to save 2 cookies so that Pops and Chloe could enjoy one more the next day. He came back and ate them for breakfast. If anyone ever wants to do something special for Clint (or most anyone else) you could bake them these cookies. Ha! I guess I'll have to make more! Yummy! I have pinning these for later! The caramels bits definitely make it so easy! I hope you enjoy them! 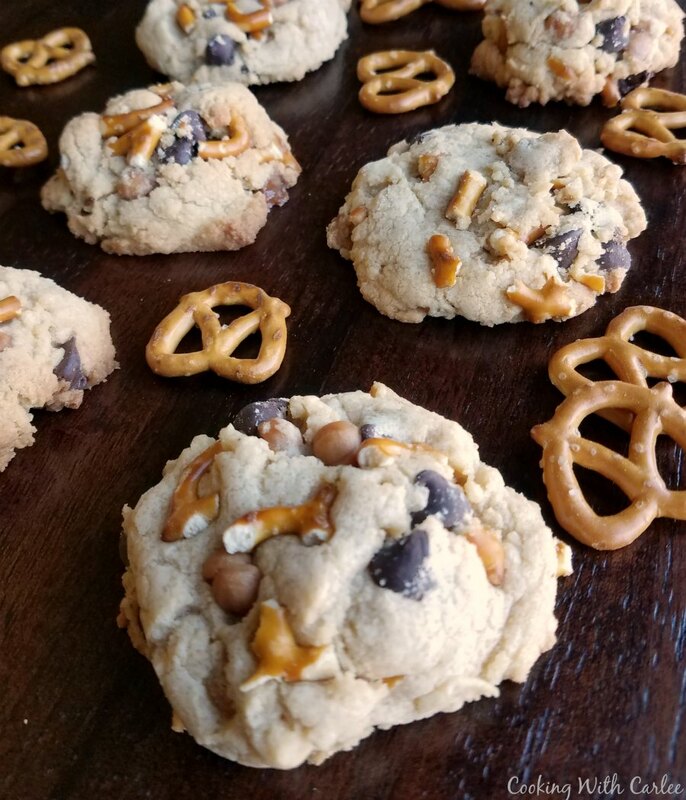 We will love this yummy cookie, I NEED one right now!Thanks so much for sharing your post with us at Full Plate Thursday this week. Hope you have a great day and come back soon! These look nothing short of AMAZING! Thanks for linking up at Friday Frenzy Link Party. PINNED! Hi Carlee, the name of these did make me laugh and I am so glad they aren't made with the orts in the kitchen sink!... Where were you when I had my two, I'd have quite happily let you move in if you came bearing goodies like these cookies. Two weeks ago I thought I'd never be able to face another sweet thing, but how wrong I was! It can get to be a lot if you are doing dozens of cookies! Luckily these don't take too long to rotate through. I love "kitchen sink" recipes. They always make me feel like I'm rescuing ingredients that would otherwise go to waste! I love that part too. Plus some of those strange mixes that result end up being new favorites! I tried these for the first time recently at Panera and loved them - it's that sweet and salty thing. :-) Bonus points? This is an awesome recipe to clean out the pantry! Sweet and salty gets me every time. It is a good way to use up the bits that are laying around too. Win, win! I've not had this cookie at Panera but I love sweet and salty combos. Going into the "to try" file for sure! Yum! an interesting combination but they look good! We are big fans of sweet and salty, so it didn't take much convincing here! Thank you! It's like a chocolate dipped pretzel and a cookie had a baby! Amazing! A tasty baby ;-) Thanks!